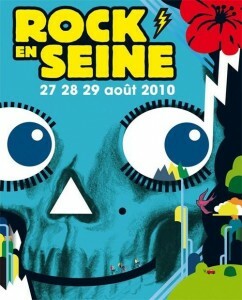 Rock en Seine est un festival de rock qui a lieu dans le parc de Saint-Cloud (département des Hauts-de-Seine), au cœur de jardins historiques dessinés par Le Nôtre. 27 août : Blink 182, Cypress Hill, Underworld, Skunk Anansie, Black Rebel Motorcycle Club, Foals, The Kooks, Band of Horses, Kele, All Time Low, Minus the Bear, Deadmau5, French Cowboy, Beast, King of Conspiracy, Roken is Dodelijk. 28 août : Queens Of The Stone Age, Massive Attack, 2 Many DJ’s, LCD Soundsystem, Paolo Nutini, Two Door Cinema Club, Chew Lips, Stereophonics, Plan B, K’Naan, Jónsi, Jello Biafra, Naive New Beaters, Où Est Le Swimming Pool, Quadricolor, Viva and the Diva. 29 août : Arcade Fire, Beirut, Wave Machines, Fat Freddy’s Drop, The Ting Tings, Roxy Music, Eels, Rox, The Temper Trap, Wayne Beckford, The Black Angels, Wallis Bird, Crystal Castles, I Am un Chien ! !, Success.